Because Shanna Said So...: Giveaway - It Invloves Wine! So, who likes baseball? Even better, who likes wine? Even better, better, who likes fun wine glasses for their wine? Well, you have come to the right place. Baseball season is in full swing and it's time to get your game face on! 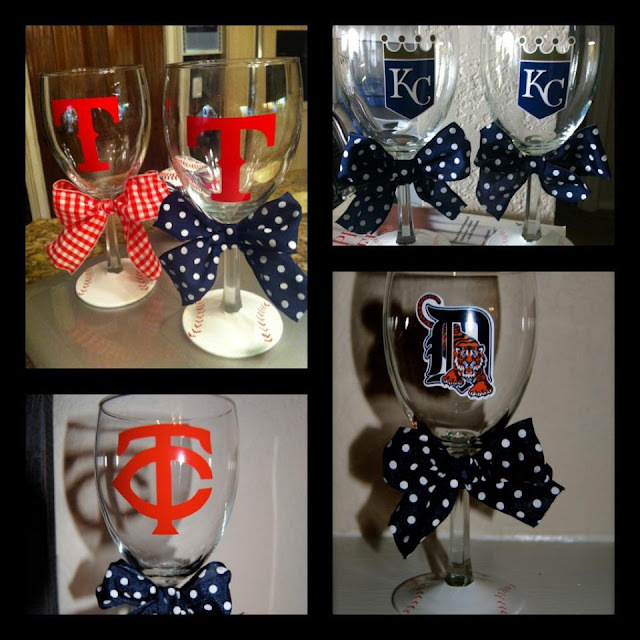 Mrs. Taylor Brigham contacted me about giving away one of her custom made wine glasses showcasing your favorite baseball team. I have fallen in love with Taylor and her etsy shop. She is precious and her glasses are made with absolute love and passion. She just moved to Texas (even more reason to LOVE her) because her hubby is now one of the pitchers for the Texas Rangers! Pretty fabulous, eh?!? I think so! Maybe she will send me an autographed ball or even better, an autographed wine glass! So, who wants to be taken out to the ballgame in style? Look how cute the base of the glasses are!! She can design one for any National or American League team. These also make great gifts for any baseball fan. This is a guaranteed home run! So, check out her shop and make sure to enter the giveaway! I will announce the lucky winner on Thursday, May 24th. Good luck...let the game begin! If you don't see the Rafflecopter gadget, please click on..."READ MORE"
I love the cardinals wine glass! Whoop Whoop ! We're both having awesome giveaways today !! I'm a sucker for cute wine glasses ! I love the Giants one! So cute! Love the wine glasses!! I need a Mets one in my life! I visted taylors shop & i love the SD glass..of course as much as the padres are not that GREAT i still love them!! This is such a cute idea, these would be perfect for some of my friends who love wine and baseball! If I won, I would have to do a Cardinals glass and give it to my dad. He LOVES the Cardinals. I need these in New York Yankees! She has such a cute Etsy shop! I follow on bloglovin' via moorehe2@yahoo.com! such a cute shop idea - my favorite is the washington nationals! I love wine and I love fun wine glasses too!!!! Love the Atlanta Braves one. Fun giveaway! I'm a SF Giants fan!! !